Home › The Bible Re-Viewed › Does John 3:18 Mean that All Non-Christians Go to Hell? He that believeth on him is not condemned; but he that believeth not is condemned already, because he hath not believed in the name of the only begotten Son of God. In three short verses, the God who so loved the world turns around and condemns everyone who doesn’t believe in his Son. And that means most of the people in the world are going straight to hell. At least, so say many Christians. Apparently these Christians haven’t bothered to read what comes before and after John 3:16–18. And they haven’t even carefully read what John 3:18 itself says. The fact is, John 3:18 does not say all non-Christians go to hell. And if we read it as part of Jesus’ whole teaching in John 3:1–21, it says something very different from what these Christians preach. These “Christians” have strayed very far from Jesus Christ. Instead of showing love and compassion to all different types of people, healing the sick and serving the poor and needy, these “Christians” consider themselves better than everyone else. They condemn billions of good people to eternal torture just for believing the wrong thing. But it is these “Christians” who believe the wrong thing. Read on to learn what these words from John 3 really mean in the original Greek, and in the context of the whole story. What those tracts don’t do is quote the rest of the story. Did you know that originally there were no chapters and verses in the Bible? Yes, there were books. But in the original manuscripts of the Bible—especially of the books of the New Testament—there was just a continuous stream of words, with no breaks at all. Our present-day chapter and verse divisions were added many centuries later. In other words, originally the various books of the Bible were each meant to be read as a seamless whole, telling and developing their themes and their story as they went along. This should clue us in that taking one or two verses out of the Bible and using them to “prove” some doctrine is an iffy proposition at best. The way the Bible was originally written, everything it says is connected to what comes before and after it. Everything in the Bible gains its meaning, not as an isolated saying, but as part of the whole story and teaching in which it is embedded. In other words, we can’t properly understand anything the Bible says without paying attention to the bigger picture all around it. And to fully understand any part of the Bible, we must read the whole Bible. But for now, we’ll stick mostly to the immediate context of John 3:18, which is the story of Jesus’ night-time conversation with Nicodemus, a Jewish leader and teacher. The main theme of that conversation in John 3:1–21 is Jesus’ teaching that in order to enter the kingdom of God, we must be born again (which can also be translated, “born from above”). I encourage you to click the link and read the whole story for yourself. In the story, Nicodemus doesn’t get it. “How can someone be born when they are old?” Nicodemus asked. “Surely they cannot enter a second time into their mother’s womb to be born!” (John 3:4). Jesus then goes on to say that he is not talking about being born again physically, but rather being reborn spiritually. Nicodemus still doesn’t get it. What comes before this in the story is our first big clue to what Jesus is really talking about here. Jesus’ words in John 3:16–18 come in the context of a conversation about the necessity of being born again spiritually. His words about believing in the Son are not about mere belief. They are about a belief that leads a person to God’s kingdom and eternal life—which, Jesus has just said, requires spiritual rebirth. In other words, the “belief” that Jesus is talking about here is not merely believing some church doctrine, such as the (false) Protestant dogma that Jesus paid the penalty for our sins. Rather, it is a belief that leads us to leave behind our old selfish and sinful self and be reborn as a new, more thoughtful and loving person. Here Jesus goes on to say why people do or don’t believe in him. And it’s clear that the belief he is talking about is not some intellectual acceptance of some particular “Christian” teachings. Rather, it is something we do based on whether our deeds—meaning the way we live—are good or evil. Jesus says that those whose deeds are evil hate the light and will not come to the light for fear that their evil deeds will be exposed for what they are. But those who live by the truth—meaning those who live good lives full of helpful deeds for their fellow human beings—love the light and come to the light so that it’s clear that the good deeds they do are not their own, but come from God (drawing more closely on the original Greek text). The people who do not believe, Jesus says, are the ones who hate the light and will not come to the light because their deeds are evil. Now let’s put this in the even wider context of the Gospel story as a whole. In a very dark and dangerous time, when Israel was ruled by Rome with an iron fist, and the Jewish hierarchy was able to stay in place only because it submitted to Roman rule and worked with the Romans to keep the Jewish people subject to Roman rule, a man named Jesus came and preached a message that went far beyond earthly power and earthly kingdoms. Jesus spoke, not of the kingdom of Rome, but of the kingdom of God. He said that the primary rules to live by are not those of the earthly authorities with all their man-made laws, but rather God’s laws—the most important of which are to love God with our whole being, and to love our neighbor as ourselves. And as he went about preaching his message of love, truth, the reality of spirit, and the kingdom of God, he healed the sick and brought light and hope to people at all levels of society, from Roman army commanders and members of the Jewish ruling council right down to poor day-laborers, women (whose status was very low in ancient society), prostitutes, and slaves. How did people respond when they encountered this spiritually powerful man of light and love who entered into the darkness of their lives? Did they, like Nicodemus, recognize that he came from God? Or did they reject him and accuse him of doing his miracles of compassion and healing through the power of Satan (see Matthew 12:22–28)? Their belief or non-belief in Jesus was no mere intellectual assent to church dogmas about justification, salvation, and the divine status of a man who lived 2,000 years ago. Rather, their belief or non-belief was their acceptance or non-acceptance of the powerful message and the powerfully good deeds of Jesus himself, in person—a man who spoke things they had never heard before, and who had compassion on the sick and the poor and the needy. Anyone who would reject that powerful presence of light and love would do so only because he or she lived, not for what is good and right, but for personal power, wealth, and privilege. This is what Jesus is talking about in John 3:18. He is talking about people who reject the light when they encounter it because they are too busy pursuing their own selfish and materialistic desires to care about what is good and right. He is talking about people who consider it ridiculous and just plain inconvenient to love God above all else and love their fellow human beings as much as they love themselves because it would conflict with their pursuit of personal pleasure, wealth, and power. Now I ask you: Is that a good description of conscientious Hindus, Buddhists, Muslims, Jews, native peoples, and people of all other non-Christian religions and beliefs who love God as they understand God, and who devote their lives to loving and serving their fellow human beings? Is that a good description of people who, even if they do not have an intellectual, doctrinal belief that Jesus Christ is God, or the Son of God, actually live by the two Great Commandments that Jesus taught: to love the Lord our God with all our heart, soul, and mind, and to love our neighbor as ourselves (see Matthew 22:34–40)? Who are the real Christians? The ones who say “Lord, Lord” to Jesus Christ, or the ones who do what he says (see Luke 6:46–49)? In his parable of the sheep and the goats in Matthew 25:31–46, Jesus says that people of all nations who help their fellow human beings in need will go to eternal life, while those who do not will go to eternal punishment. And in Romans 2:1–16 Paul says the same thing, telling us how Jews, “Greeks” (pagan polytheists), and Gentiles (non-Jews or non-Christians) will be saved, or not, based on whether or not they did good deeds according to their conscience. If we read John 3:16–18 in the context of Jesus’ entire conversation with Nicodemus, it is clear that Jesus is saying the same thing here as well. Those who believe in God’s one and only Son, Jesus Christ, are those who follow his commandments. They are the ones who love God above all, and love the neighbor as themselves, regardless of what church or religion they belong to. Those who do not believe in God’s one and only Son are the ones who hate the light because their deeds are evil, so they avoid the light and flee it whenever they encounter it. This, and not some “Christian” doctrinal belief or membership in some “Christian” church, is what Jesus is talking about in John 3:16–18. Unfortunately, what non-Christians commonly encounter when they come face to face with the “Christians” of today are not human beings who show love and compassion, heal the sick, and serve the poor and needy. Instead, they encounter people who consider themselves better than everyone else because they have the “correct” belief, and who condemn everyone but themselves to horrible and eternal torture in hell merely for believing the wrong thing. Does an encounter with these so-called “Christians” of today, with their horribly false attitudes and beliefs, their pride in themselves and their own righteousness, and their condemnation of anyone who doesn’t believe the way they do, in any way compare to encountering the powerful being of love, light, compassion, and healing who was Jesus Christ? Can we really blame the non-Christian people of the world for fleeing the darkness, bigotry, and violence against all other religions, people, and nations that much of “Christianity” today has become? Sure, there are some bad apples among non-Christians. And unfortunately, they are the ones who make it into the nightly news. But the vast bulk of ordinary Hindus, Buddhists, Muslims, and so on are good people who live according to their religion and the teachings of their God far better than most Christians do. These are not the people who “have not believed in the name of God’s only Son.” That “name,” or spiritual power of Jesus has never been shown to them by the so-called “Christians” of today. Good, conscientious non-Christians are not the people Jesus is talking about in John 3:18. Good, conscientious non-Christians are people who live by the truth and come to the light as much as they encounter it. And it is an unfortunate reality that their own religions often give them far more light than most of the so-called “Christianity” that they encounter in the world today. If most Christians today actually lived by the plain, simple, good, and loving teachings of Jesus Christ, perhaps it would be different. Perhaps the Christian world would show enough of the true light and love of Christ that the non-Christian world would be drawn to a conscious belief in Jesus Christ. 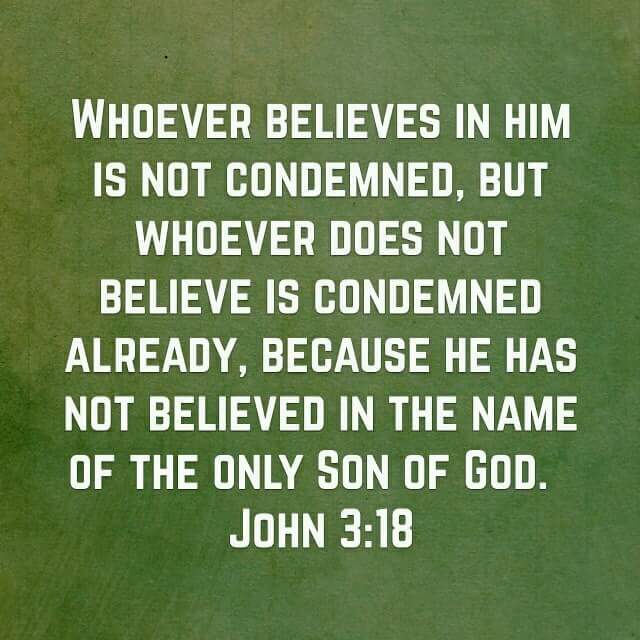 Now that we’ve put John 3:18 in its wider context, let’s zoom back in on this verse and learn what it really says. Did you notice that where the KJV uses the word “condemned,” the YLT uses the word “judged” instead? That’s because the basic meaning of the Greek word κρίνω (krinō) is not condemning, but rather judging between one thing or action or person and another. It’s only if the judgment is a negative one that it becomes condemnation, or in legal language, a guilty verdict. Rather, the judgment is “pronounced” by the actions of the people themselves. Those who flee the light because their deeds are evil have pronounced judgment on themselves—and it is a judgment of condemnation and spiritual death. Those who come to the light so that it may be seen that their deeds are done in God have also pronounced judgment on themselves—and it is a judgment of spiritual life in God’s kingdom. In short, if we read John 3:18 very carefully, paying attention to what the original Greek words mean, it is not talking about God judging non-believers, or non-Christians, to eternal hell. Rather, it is talking about people who hate the light of truth and do not believe the truth because their deeds are evil passing a judgment of condemnation on themselves. Would Jesus really say something completely different in John 3:18—that all non-Christians, who don’t “believe” in him, are going to hell? First of all, John 3:18 doesn’t actually say anything about anyone—Christian or otherwise—going to hell. Rather, it says that whoever does not believe is already judged by that non-belief. Jesus then goes on to say what he means by “not believing” in John 3:18: he means hating the light and fleeing the light because one’s deeds are evil. In other words, in John 3:18 Jesus is saying the very same thing that he says in John 6:46 and Matthew 7:21. It is not those who merely call him “Lord” who will enter the kingdom of heaven, but those who do what he says, and who do the will of his Father in heaven, which are one and the same thing. That is what Jesus means by “believing” in John 3:16–18. And not doing what he says is what he means by “not believing” in John 3:18. So does John 3:18 mean that all non-Christians go to hell? The traditional and conservative Christians who make this false claim have yanked John 3:18 out of context, paid no attention to everything else Jesus says in John 3:1–21, and ignored what he says elsewhere in the Gospels about who is and isn’t saved. As a result, they have completely misunderstood and misrepresented what John 3:18 says. What it does say is that all people who show their unbelief by rejecting the truth because of their evil, selfish, and materialistic attitudes and actions have judged themselves to spiritual death. That is true whether or not they call themselves Christians. Christians who disobey Jesus’ commandments are Christian in name only, no matter how “correct” their doctrine may be. Such “Christians” are, in fact, unbelievers. They have judged and condemned themselves by their actions, just as Jesus says. But people who obey what Jesus teaches in their lives—whether or not they call themselves Christians, and whether or not they have a doctrinal belief in Jesus Christ as the Son of God—have in practice “believed in the name of God’s only Son,” and have entered through the gates into God’s eternal kingdom. ‹ What if the Right Woman has the Wrong Feet? As a Messianic Gentile believer, (I’m not necessarily in the “Christian mainstream” in this respect), since I do believe in faith with obedience, yet not in a self-righteous way. I believe and follow Biblical teaching to the best of my understanding, the way that the early church believers did. I believe it is important that all people understand that faith is more than just keeping the ‘letter’ of the Law, in a very self-righteous way, but instead from a heart-felt obedience and response to YHWH and Yeshua’s commands (even if yes, we do this so, so imperfectly and fall short-ALL of us)!! Yet you can’t just throw the baby out with the bathwater,so to speak. I know that your articles must help many Christians and others of many faiths as well to live up to the highest of their own faith’s teaching. Thank-you Lee! Thanks for stopping by, and for your good thoughts. Yes, as you say, living from faith—or as it really should be translated, faithfulness—is more than just keeping the letter of the Law. It is living by the spirit of God’s commandments, which, at their heart, are all about loving God and loving our neighbor.